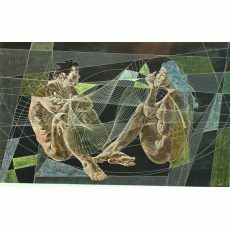 Hans Erni was born in 1909 in Lucerne (Switzerland) as the third child of eight siblings. His father was a cabin cruiser engineer on the Vierwaldstättersee, and there were no traces of artistic inclinations in his family. 1915-1927 he attended Public School, apprenticed as measurement technician, and later as building constructor. It was during his apprenticeships he acquired his first knowledge about art literature, which made him decide to continue his professional career as artist, so he attended the School of Arts and Crafts in Lucerne 1927-1928. The years 1928-29 were spent in Paris at the Académie Julian, where he was awarded a first prize in an art competition, at the same time working as free lance artist in his own studio. In 1929 he continued to Berlin where he spent two years in the United Stately College for Free and Applied Art. Returning to Paris in 1930 he met several contemporary artists, and was deeply impressed by Picasso and Georges Braque ad their work. It is certainly not unjustified that Erni is called "The Swiss Picasso". After travels to Belgium, Italy and London, and several public commissions in his native Switzerland, he was the co-founder of the Swiss Group of Abstract Art "Allianz". To the public Hans Erni is best known for his numerous wall-decorations and sculptures, displayed practically everywhere in Switzerland; little is known, however, about his talented stamp designs. His very first stamp designs for Switzerland were issued in 1964 as propaganda stamps -- Pro Aqua (1964), and Planetarium (1969). After prolific years with many travels, studies and public commissions for Switzerland, his first stamp designs for Liechtenstein appeared at the occasion of the 250th anniversary of the principality. The set depicts various symbols, with the portrait of the princely couple added to the 80c-value. 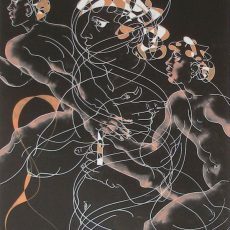 In 1971 Hans Erni designed the Liechtenstein issues for the 11th Winter Olympics in Sapporo, Japan. (Scott # 492-495), and in 1972 followed the stamps for the 20th Summer Olympics in Munich, also issued by Liechtenstein. (Scott # 496-499), and stamps for the Swiss Post Office, portraying Giacometti, Ramuz, Le Corbusier, Einstein, and Honegger. In 1975 followed the designs for the Swiss stamps honoring "International Woman's Year", and in 1981 the Pro Aero stamp at the occasion of the 50th anniversary of the then flagship of the Swiss Aviation, Swissair. The latter stamp is a semi-postal with the surcharge of CHF 2+1. On September 15th, 1979, the Hans Erni Museum was inaugurated in Lucerne, and that same year the artist designed the Swiss portrait series of personalities that became Swiss by Choice; an interesting set, which I display with great pleasure, as all of these personalities were artists that found their final artistic freedom in Switzerland. There is no mention of Hans Erni doing these stamps, neither on the stamps nor in the Swiss Zumstein-catalogue; the fact is only mentioned in Hans Erni's biography on the Internet. In 1993 Hans Erni visited Hong Kong for further studies, and later that year he was present in the United Nations' Building in New York at the occasion of the International Peace Day, where his stamp designs for Peace were released by the UN in New York, Geneva, and Vienna. Two of these issues are shown below. They are true masterpieces of graphic art, and have the unmistakable "Erni-touch". In 1995 came the latest -- and probably also the last -- stamps from Erni's hands. Fully understandable since he that year celebrated his 86th birthday. The Erni-issues for both years were Europa Stamps. 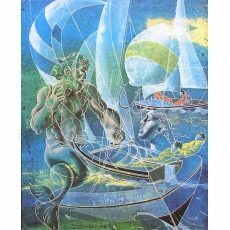 Hans Erni celebrated his 95th birthday in 2004, and was at the same time honoured with the title "Honorary Citizen of Lucerne". Through his work Hans Erni has truly brought art to Swiss philately.